If you’ve been into metal for more than three years, you’ll know that Behemoth’s 10th album, 2014’s The Satanist, was a breakthrough occult opus of dizzying magnitude. The most extreme record ever to top Metal Hammer’s Album Of The Year poll, it crowned this Polish trio’s gradual 20-year ascent from corpsepainted teenage wannabes to one of the most prolifically brilliant and significant forces in modern extreme metal. Composed in the shadow of the leukemia treatment undergone by founding singer/guitarist Adam ’Nergal’ Darski, The Satanist acted as a coruscating rebirth for Behemoth, suffused in a fiery attitude of no compromise. Drained by the process, Nergal turned his talents to a much quieter project, Me And That Man, nursing his soul with a beguiling set of gothic country folk-blues in 2017. With that mellow introspection out of his system, Behemoth have been rejuvenated again, and the question of how they can follow The Satanist is answered in heartening style: by having a bit of fun with it. Nergal asserts in the press release that AC/DC are “the best band on the planet”, noting that 15 years ago he’d have said the same about Mayhem or Morbid Angel. 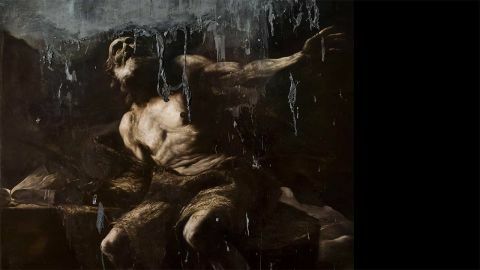 “That,” he says, “should give you a clear indication of why this album is more rock-based.” But don’t go thinking Behemoth have done a Black Album; if Hetfield had taken Nergal’s approach to accessible rock-based reinvention, Nothing Else Matters would have had ravening blastbeats and venomous, anti-Christian blood-gargling over it. There is, somehow, an odd sense of balance between AC/DC and Mayhem in the quirky, compelling dynamism of killer songs like Bartzabel, If Crucifixion Was Not Enough… and triumphant imperial earworm Sabbath Mater. Muscular, elegant arrangements give rise to atmospheric but infectious hooks, less complex but as creative as ever, honks of groovy organ and squealing melodic leads reminiscent of a 70s live gatefold syncing up with treble-heavy, finger-picked riffs straight out of Norway’s Inner Circle. There’s a jet-black gleam to the production but with a crucial layer of graveyard dirt under the fingernails, and a sense of disorientating stereo mischief in the mix, bubbling with theatrical embellishments, voices travelling from ear to ear, full orchestra and choirs going full-tilt horror soundtrack. It’s all loaded with such audacious, singular force of personality – especially Nergal’s no-holding-back vocal performance, but equally evident in Orion’s weightless bass wanderings and Inferno’s tour-de-force drum barrage. Behemoth’s bludgeoning chops, vicious tempos and esoteric atmospheres remain firm, but there is a dark streak of humour and a paradoxical joie de vivre running through I Loved You At Your Darkest. The title, a simplified, contemporary paraphrase of Christ’s words, signals the band’s impulse to shake up the formula, deviating from their tradition of snappy, definitive album titles, adding wilful ambiguity and a puckish desire to perplex. Behemoth continue nailing black and death metal simultaneously; it’s what they do. But on their 11th album, these long-serving master craftsmen have channelled the ethos of rock gods.